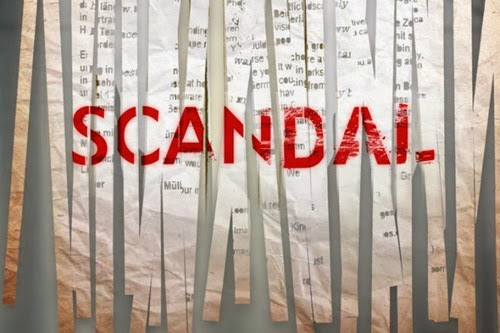 Scandal Thursdays are back! There was a lot of anticipation leading up to Thursdays episode and I have to say I was not disappointed. It was good. It had my heart racing. There was a lot going on, as usual, so I have a lot to discuss! Having become a Scandal information stalker, I actually had heard spoilers on a lot of the big “surprises” in the episode – namely that Adnan Salif is actually a woman, and that Mellie had a prior relationship with Jon Tenney’s character, Andrew. Seems we will learn even more about that one next week! Okay, here’s my thoughts on the various plot lines in this episode. Harrison has been freaking out about the return of Adnan Salif, who turns out to be a woman played by Nazanin Boniadi, who played Fara Sherazi on Homeland. Harrison is terrified of Adnan, but instead of shooting her, as he seemed to be planning to do, he got naked on his desk with her. Um, okay. She’s gone ahead and announced she’s running for president against Fitz. However, she’s not resigning as Vice President. Well that’s one way to burn your bridges! Can’t Fitz fire her? I guess not, as he’s freaking out, drinking, throwing things, and throwing people out of his office, including Olivia. Oh wait, I was talking about Sally. Well, I guess the important part is that there is a question about the way Daniel Douglas died now, and why there was no autopsy. Is there always an autopsy when someone dies? I thought only if there was a reason to suspect something. Well, now people are suspecting. Fitz and Olivia don’t know that there was a cover up and therefore want to find out what happened to Daniel Douglas. However, there’s now a cover up of the cover up, claiming he actually died from a drinking related injury. Future scenes shot in a cemetery suggest more looks into that in the future. Not only does James know what really happened to Daniel Douglas, he’s on his way to exposing the whole mess. I guess he’s finally realized just how crazy Cyrus is and decided not to help cover for him anymore. It’s sad that had Cyrus not helped Sally, he could have used the information of her crime against her. Now, he can’t expose her because he would then expose himself. But James is going to try to expose the both of them. Should be interesting. What is there to say about Mellie? First she walks in on Olivia and Fitz kissing. 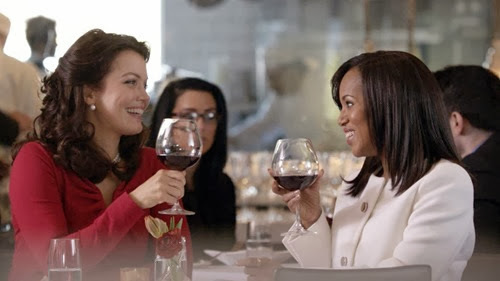 Then she takes Olivia to lunch and puts on a show that they are friends in order to show the press that there is no way Fitz is cheating on Mellie with her friend Olivia. Then we find out that Fitz’s new vice presidential hopeful, Andrew Nichols, has a one-that-got-away and that one is none other than Mellie. He says he’s been waiting to be close to Mellie for 12 years – how long have Mellie and Fitz been married? Longer than 12 years, I believe. We will have to wait and see what exactly happened the last time Andrew saw Mellie. An affair or…? 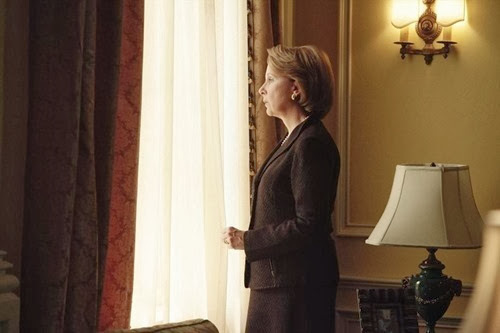 Poor Olivia goes off to comfort her father about losing his job and he informs her of his intention to take down the presidency and use Olivia to do it. I’m certainly scared! Olivia neglects to inform Fitz that her father is after him, but instead tells him that Mellie wants her to start dating. Someone other than Fitz obviously. So Olivia appears out walking with and kissing Jake. When Fitz asks her what she was thinking, she reminds him that he said he trusted Jake. I’m not so sure he trusts him with Olivia though! I just want to mention that I totally predicted that in order to hide the Olivia / Fitz rumors resurfacing, they would have Olivia hook up with someone else. Fitz isn’t letting her go this time though. She’s not resigning as campaign manager either. Did I cover all the important parts of the episode? There was so much going on that I’m sure I could write more, but these are the things that stand out for me right now! Let me know what you think! Also, Kerry Washington is speaking at the BlogHer conference in July. I so want to go! !